Stress occurs whenever we perceive ourselves to be in a situation where we feel that we do not have the capacity to influence or achieve the outcome we want. What may be stressful to one individual may not be stressful to another. We need to answer the question Am I bigger than it? Or is it bigger than me? If we perceive a situation is too much for us this creates the stress response. Stress can have many psychological and physiological effects upon the body and is known to be a contributory factor in disease. Two main endocrine systems are involved physiologically, the hypothalamus-pituitary-adrenal axis (HPA) and the sympathetic-adrenal medullary (SAM) system. Under stress the HPA axis is stimulated and the adrenal glands, which sit above the kidneys, secrete the hormone adrenalin to help the body prepare and act in a “fight or flight” situation by raising heart rate and blood pressure to boost energy, while cortisol the primary stress hormone, increases the level of glucose in the blood stream to further raise energy. However to do this, other systems in the body need to take a back seat and there is a decrease in function in the digestive, reproductive and immune systems. Similarly other hormones released via the SAM system work with the autonomic nervous system, in regulating cardiovascular, immune, skeletal and respiratory systems. What is important is that this situation works well when it is short lived, but if there is repeated or long term activation of these systems then this has a detrimental effect on the body, increasing the risk of physical and mental health problems and long term fatigue. Recognising that you may have a problem with stress is very important as we all have demanding lives, but you may have symptoms of disturbed sleep, allergies, difficulty with digestion, increased weight gain around the middle, memory and concentration problems, fatigue, difficulty relaxing and changes in emotion such as anxiety or a feeling of being overwhelmed. These maybe the early signs of disturbances in the rhythm of cortisol which can be assessed by an adrenal stress test. The test recognises the 3 stages of maladaption. Stage 1 – An alarm reaction with raised cortisol. Stage 2 – Resistance, where the cortisol levels are unable to keep up with demand. Stage 3 – Adrenal exhaustion where cortisol levels are low throughout the cycle and this state may result in an individual being chronically fatigued. At Optimal Energy Nutrition we work in the 3 areas of nutrition, the physical body and the mind to help address the body’s imbalances. Eating a diet high in refined carbohydrates, sugar and processed foods may be lacking in appropriate nutrients, putting an adverse strain on the adrenals and the ability to form appropriate hormones. Dietary supplement and lifestyle changes can effectively help balance cortisol and adrenal function. Appropriate exercise can significantly improve cortisol levels and adrenal functioning. 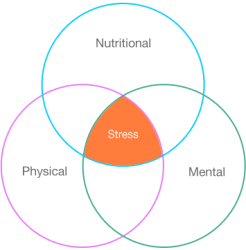 Understanding how to combat the effects of stress is very important and once identified it needs to be addressed, to improve the body’s energy systems to optimise health and wellbeing.